This 17.9 mile linear Backpacking Trip took place the weekend of September 13-15, 2002 along the AT between Caledonia State Park, PA and PenMar Park, MD. 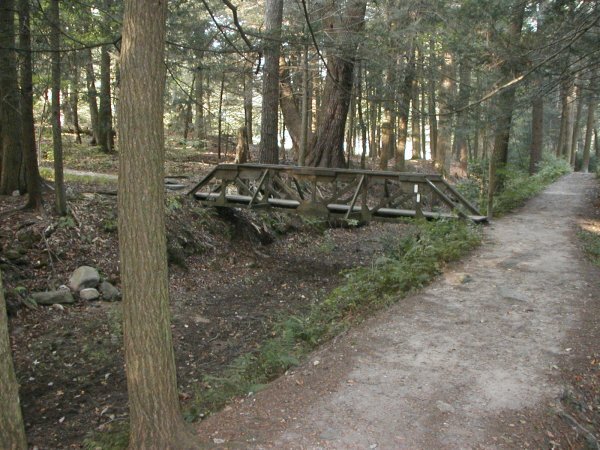 9/13/2002- Arrived at Caledonia State Park around 12ish. As usual I was the first one there. So I parked my car in the middle of the park so that others would see that I was there. I then hiked some very nice small loop trails in the park. One of them went by an adjacent group camp site just north of the park. It was wide open and totally empty. 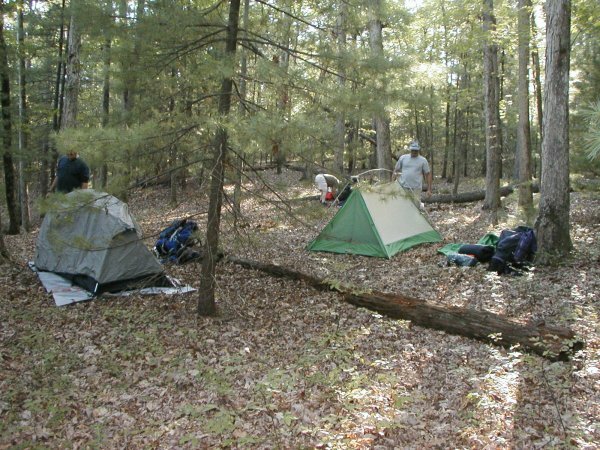 We should probably consider utilizing these group camp sites in the future the way that our turnouts for hikes have been lately. I then scouted out the AT from the park parking lot to US 30, returned to my car and drove by the campsite. Frank Maida and Jerry McCumbers were there and waiting. Jerry brought a box of Auntie Anne's Pretzels and 3 different sauces courtousy of his daughter Danielle's Auntie Anne shop at Francis Scott Key Mall near Frederick, MD. They were excellent! Thanks, Danielle. John Geisler arrived shortly afterwards. We spent the afternoon shuttling some of our cars, talking, eating and setting up our tents. We were waiting for Bill Isham and his wife Chris as well as Doug Knowles and his nephews, but neither showed. I thought that it may be just the 4 of us for this hike. Our campsite was nice. It was narrow but extended up a hill onto a wide plateau. This is where we pitched our tents. It was a warm and pleasant night with no rain. 9/14/2002- The next morning we looked to see if Bill or Doug got in late last night. They didn't. So we thought that it would be just the 4 of us. About 8AM, we heard the roar of Bill's vintage Blazer coming down the road. He drove past our site since the site number was obscured and there were no familiar cars at the site. I ran down the loop and caught him and Chris as they were coming around. There were now 6 of us ready to start this hike. So some of us drove the cars to a parking lot on the south side of the US30/PA233 intersection. John G and I hiked through the park. We all met where the AT crosses US30. The first 3 miles were slightly uphill. We would be walking near a rocky ridge. Sometime, the trail would go up to the ridge and parallel it. Sometimes, it would drop off of the ridge and be decent trail. We definitely had our share of Pensylvania rocks on this trip. Once we passed the Rocky Mountain Shelters (aptly named!) we started a down towards PA233. Frank had gotten a few miles ahead of us. The rest of us stopped just before PA233 for a lunch break. This was the 4.5 mile mark. We then crossed the road and did a short level stretch, then a long up towards Chimney Rocks. We passed a power line and a gas line as well as numerous old roads and unidentified trails. This was a tough up. 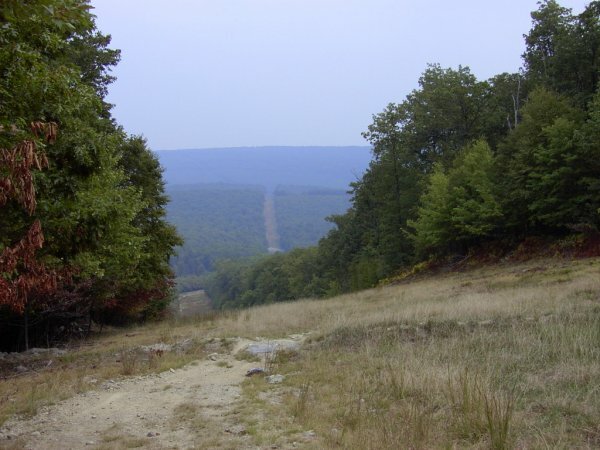 Once we hit Chimney Rocks at around the 8.5 mile mark, the trail started a steep, long down towards Old Forge RD. 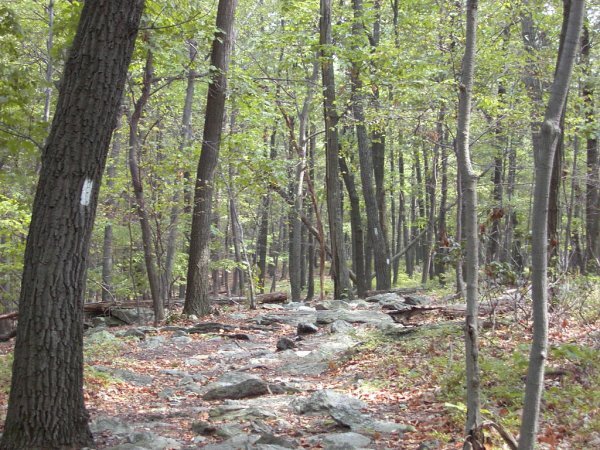 One of our members last year told us to hike this stretch of trail from north to south. This was the reason why. It was a rocky, difficult down. We had also been feeling intermittant drops of rain since starting this down so we were anxious to make it to Antietam Shelter, our destination for today. We passed the tumbling Run Shelters at mile 9.5, which were fully occupied. Then we crossed Old Forge RD. We next came to a spring house where we loaded up on water. That water was cool and tasted good on this mid 80 degree day with some humidity. We finally got to the Antietam Shelter around 4:00 PM. Frank had gotten there about an hour before. We did not have a fire that night or the previous due to a fire ban in the state forest. We did about 11 miles and were ready to settle in for the night. Amazingly, the shelter was empty! We did not see any water source between Caledonia State Park and the spring house just north of the shelter. So we ate and settled in for the night. As we were starting to eat we heard someone from the south yell "Mike!". It was Doug K and his 2 nephews Josh and Michael. They had hiked up from PenMar and were going to stay the night and hike back with us the next day. So now there were 9 of us! 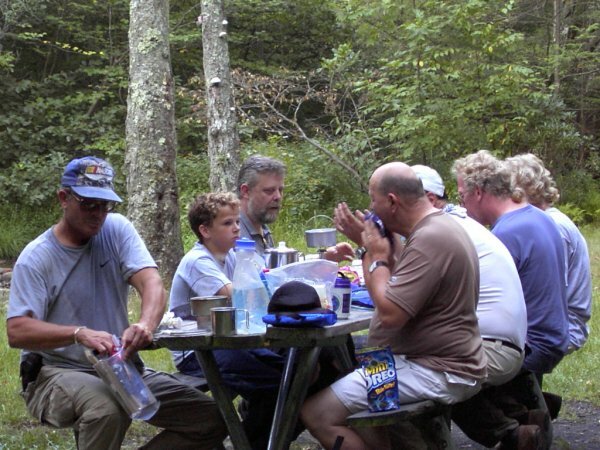 Later that evening, as we were settling in, we were amazed that a southboud thru-hiker came into camp. His trail name was 'Willie McGee' and he had done 30 miles that day. So we made a spot in the shelter for him to put his sleeping bag. He then ate and talked with us. 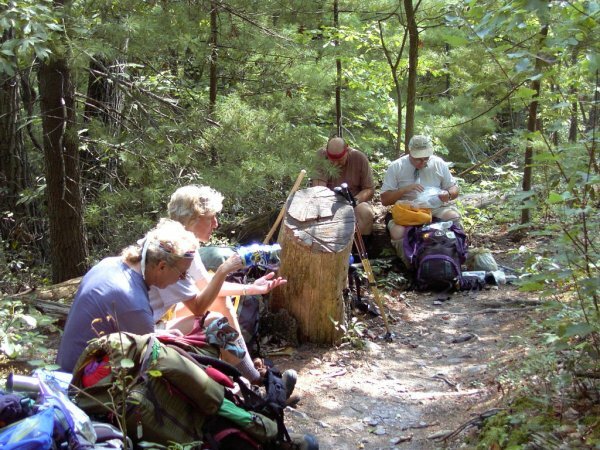 He said that about 100 people had attempted thru hiking the AT from ME to GA this year. He said that 3 or 4 dropped out right after the 100 mile wilderness in ME, which many say is the toughest stretch of the entire trail. Again we had a quiet night with no rain. 9/15/2002- That Sunday morning we got up and were amazed that it did not rain during the night even though the forcasts had called for it. The skys did look threatening so we knew that we would get it today. So we ate breakfast and started packing up. As we were doing so Charlie Johnson arrived to day hike with us. So we now had a total crew of 10 for this trip. 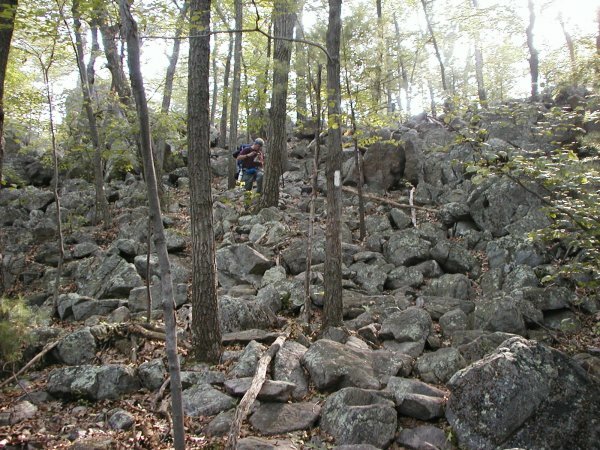 So we started out and immediately had a long, tough up over more Pennsylvania rocks. We passed the Deer Lick Run 'Stereo' shelters, then had a slight down to the Bailey Springhouse at around the 4 mile mark for the day. It was at this point that it started to rain. It was a light rain at this point, which felt good to hike in. We then had an up and then a down to PA16. We then had another up to old PA16. We then had a long up, then a down to Buena Vista RD at around the 6 mile mark. We then had a down along rocky, crappy trail, then got to polluted Falls Creek. We then had tough up to PenMar RD, crossed the border into MD, did one last up and got to PenMar around 1PM. We then met 2 more southbound thru-hikers. Then we took the group picture, drove back to our cars, and proceeded to a recently opened Ryans Restaurant in Chambersburg, PA for a great smorgesboard brunch. This was a decent hike. The trail was very rocky and there were more than enough ups. I'm glad that we finally hiked the AT as a group in PA. It wasn't easy, but I look forward to getting the rest of this state completed. Typical PA rocks on the trail. Dinner at Antietam Shelter, MD. Scenic View from gas line. More rocks at mile 3.5.